There is an irony to the Trump supporters cheering the recently signed executive order which ‘promotes religious liberty‘. These people, led by Vice President Pence, believe this country isn’t religious enough, but of course, they mean not Christian enough (their particular faith). The irony is that this group of supporters, flag waving, consider themselves the ‘real Americans’ yet, as Hitchens reminded us frequently, the Founders (would they pass Trump voters’ ‘Real American’ test?) were men of the enlightenment, and they thought enough about the issues of religion and state that they went through a lot of trouble to separate the two. That’s what makes us different than the places from which the Founders fled. Hitchens explains it to the thick Ken Blackwell in this video. Hitchens addresses the topic in Thomas Jefferson: Author of America, and of course with a broader perspective, in God is Not Great. Trump is likely not interested in religion, but he’s a big fan of throwing bones to his base. This is a great interview with Hitch on The Steve Kane radio show, after one of his debates with William Lane Craig. It’s a civil exchange between Hitch and a pastor who found God, and who suggests that his conversion is proof of God’s existence. It’s a great example of Hitchens’ skills of debate. Many of you will have seen this classic, but for those of you that are new to Hitchens and his orbit, it is well worth watching. 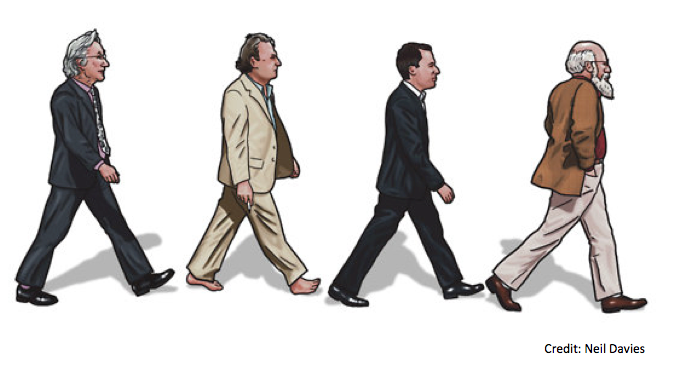 The film documents an almost two-hour roundtable discussion with the so-called new atheists: Hitchens, Richard Dawkins, Sam Harris and Daniel Dennett. The group, also nicknamed “The Four Horsemen of the Non-Apocalypse”, met at Hitchens’ Washington DC apartment on September 30, 2007. For the non-Biblical scholars amongst you, the name is a reference to the Four Horsemen of the Apocalypse in the Book of Revelations. I am glad someone had the foresight to document this. Enjoy being a fly on the wall.